During my travels to Guatemala, I spent 3 days visiting the ruins of the Mayan city known as Tikal and the town of Santa Marta in Guatemala. 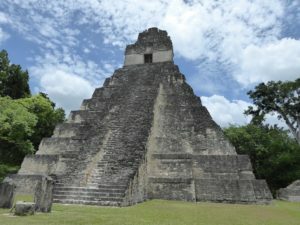 First we flew to Santa Elena, then took a bus to Tikal. The ruins of this Mayan city sit in the middle of the jungle north of Guatemala close to the border with Mexico and British Honduras. This city was complete with two temples at either end of a city square the length of many football fields. For the next two days, we spent exploring the ruins. Walking up one of the pyramids was fun, hard exercise, and exhilarating at the same time. You could sense the amount of time these pyramids have been in existence and what they have witnessed. A civilization’s rise, zenith and fall. Mother Nature taking over and completely burying the whole city. We got caught in the rain at the top of one of the pyramids. and literally saw the rain approaching from the other pyramid. It was great seeing the surrounding countryside above the tree line of the jungle. We had lunch and dinner at a makeshift restaurant underneath the trees. It was local food and very tasty. All the exercise made us very hungry and tired. After lunch we explored some more. The next day we finished our exploring and got finished at 4pm. Then, it was time to go back to the hotel. We had a bus full of tourists and on the way out of Tikal, we found a French tourist lost in the jungle, left behind by his tour group, and wandering aimlessly. He spoke French only, so someone in the bus who spoke French determined the plight of the Frenchman and we took him back to his hotel to reunite with his group. A good deed for the day. Spent the night day in a beautiful B&B outside of the town of Santa Elena. The B&B was in the woods and had its own lake. My friend and I went swimming in the lake and we were the only human beings there. Afterwards we sat by the edge of the lake and had a couple of beers and talked about Tikal and the experiences we had. Discussed how the people lived back then: farming, harvesting, keeping the jungle from taking over. The festivals and celebrations in the city with the king and the priests, the sacrifices, the games, etc. The common folk lived outside the city in little clearings and they all came to the city during the festivals and important days in the Mayan calendar. Afterwards, we had a great dinner in the B&B made up of local foods, a grilled steak, corn on the cob, potatoes and dessert. The next morning, we arranged for a tour of the town of Santa Elena with its submerged section by the lake where could still see buildings, telephone poles, churches, etc half out of the water. Spent another day at Vieja Guatemala, an old capital by the foot of the water volcano. You could see evidence of past earthquakes and past civil wars in the facades of the Spanish style buildings and churches. The Cathedral was half destroyed by an earthquake and it has not not been fixed. There was a heavy Government Forces presence in the city, with heavily armed soldiers guarding the central square and all the government buildings around it. I bought trinkets at the local open air market next to the cathedral from a woman who had a baby on her back and several children in tow. I gave her a big tip for the kids. The many vendors were plying their wares to the tourists and local folks alike. We returned to Guatemala City and spent the last day there. The next day, we left via an early flight to JFK. It was a trip of a lifetime and a learning experience about the Mayan culture. One final note, Guatemala is going thru another earthquake right now (June 2018). There are 62 people dead and several thousand people displaced. It is another disaster for the people who have going through a lot over the last 3-4 thousands years. But the descendants of the Mayas take everything in their stride and keep on living their lives. This entry was posted in fitness, travel, writing by admin. Bookmark the permalink.